To Hildur I on the "Ships starting with H" page. 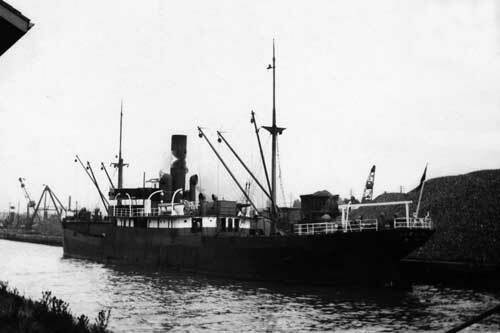 Picture shows the ship when named Grenland. Received from Ron Beaupre, taken by his late friend Ivan Brookes in Toronto, Sept.-1932. Delivered in March-1919 from Laxevaags Maskin- & Jernskibsbyggeri, Bergen as Erich Lindøe to A/S D/S Erich Lindøe (P. Lindøe), Haugesund. "Våre gamle skip" gives tonnage as 1605 gt, 927 net, 2390 tdwt, 245.2' x 37.9' x 15.6', Triple exp. 167 nhp (Laxevaag). From 1928 as Grenland of Skien, from 1937 as Hildur I of Drammen. Please be aware that errors may exist, and as can be seen, the record is incomplete. Oct. 6 Methil Southend Oct. 9 FS 302 See also Page 1. Oct. 22 Methil   OA 233 Rendezvoused w/OB 233, Oct. 24. Dec. 8 Sydney, C.B. Liverpool Dec. 23 SC 15 See also narrative below. *From Milford Haven July 30. Oct. 5 Holyhead Barry Oct. 7 BB 84 Convoy available at link above. Oct. 21 Holyhead Barry Oct. 24* BB 91 Convoy available at link above. Nov. 24 Gibraltar   XK 12 Convoy split Nov. 25. 1944 June 11 Barry Seine Bay June 15 EBC 9 Earlier 1944 movements, Page 6. Her 1944 voyages start on Page 6 and continue on Page 7, but comparison cannot be made and accuracy confirmed, because many of these 1944 voyages are not included on the archive documents. *May not have joined EBC 41, or returned to port and joined the next convoy instead? (Page 6 gives departure Port Talbot July 15). For information on voyages made in between those mentioned here, please see the documents received from the Norwegian archives as well as A. Hague's Voyage Record above. Follow the convoy links provided for more details on them; several Norwegian ships took part. Hildur I was mostly in service around the U.K., with some North Atlantic crossings early on in the war. As will be seen when going to Page 1 of the archive documents, she was at St. John's, N.F. when Norway was invaded by the Germans on Apr. 9-1940, departing that day for Norfolk, with arrival Apr. 17, continuing to Galveston that same day. She remained on that side of the Atlantic until Sept. 10-1940, when she joined the slow Sydney (C.B.)-U.K. Convoy SC 4. Her destination is given as River Medway, cargo of pulp wood; according to the archive document mentioned above, she arrived Clyde on Sept. 26. About a month later, she shows up, with no voyage information, in Convoy OA 233, which departed Methil on Oct. 22 - ref. external link provided within the table above. A. Hague says this convoy rendezvoused with Convoy OB 233 on Oct. 24, which in turn was dispersed on Oct. 27. Going back to the archive document, we see that Hildur I arrived Sydney, C.B. on Nov. 5, continuing to Mount Louis the next day, later to Gaspe and then back to Sydney, C.B. With lumber for Preston, she was scheduled for Convoy SC 14 from there on Nov. 30, but instead joined the next convoy on Dec. 8, SC 15, and arrived Preston on Dec. 27. As can be seen, when going back to Page 1, she made a voyage to Reykjavik in March-1941, and again the following month, acccording to Page 2 - looks like she remained in Iceland for almost a month, before heading back to the U.K. on May 10. Another voyage to Reykjavik was made in June that year, again remaining for about a month (these voyages are not included in A. Hague's record). In July, we find her in station 15 of the westbound North Atlantic Convoy ON 3, which originated in Liverpool on July 31, but she lost touch in fog a few days into the voyage. The Commodore says that she was "unable to maintain speed, reason unknown, but believed to be insufficient power to maintain 8 knots in smooth water. Missing in fog during the night of Aug. 3/4 in 60 10N 11 20W, night overcast". From the archive document, we learn that she arrived Reykjavik on Aug. 6, having started out from Milford Haven on July 30 (Reykjavik had been her destination all along). Having made some voyages around Iceland, she left Reykjavik on Sept. 5, joining the slow, eastbound North Atlantic Convoy SC 41, which had started out from Sydney, C.B. on Aug. 24. Other Norwegian ships in this convoy were Akabahra, Astra, Audun, Balduin, Blink, Carrier (returned), Einvik (sunk, follow link for details), Evviva, Fagersten, Fanefjeld, Grado, Gudrun, Heien, Hestmanden, Ledaal, Leka, Lom, Marga, Nesttun, Orania (returned), Reiaas, Siak and Spes (several of which joined from Iceland with Hildur I). This convoy is not yet available among the SC convoys included in my Convoys section, but will be added - see ships in all SC convoys. The following month, she's listed, together with Blink (in collision, returned), Erica, Lago and Lisbeth, in Convoy OG 76. This was a Gibraltar bound convoy, which left Milford Haven on Oct. 26-1941 and arrived Gibraltar Nov. 11, but Hildur I was only bound for Liverpool, where she arrived on Oct. 30, according to Page 3 (A. Hague gives arrival Liverpool as Oct. 27). This convoy will also be added to an individual page in my Convoys section, with more information on it; in the meantime, the ships sailing in it are named on the page listing ships in all OG convoys. On March 7-1942, I have her in Convoy RU 14 from Reykjavik to the U.K. The Norwegian Marianne is also listed, but returned to port and later joined the next convoy, RU 15. Hildur I's subsequent voyages are shown on Page 4. She was later used as ammunition and supply ship for the Torch operations, which commenced in Nov.-1942 (invasion of North Africa - my page about Athos has a list of Norwegian ships taking part in these operations). She's said to have been the 1st allied cargo ship at Port Lyautey. Page 5 has information on some of her voyages in this time period. According to A. Hague, she had sailed from the U.K. on Oct. 30 in Convoy KX 5, carrying 747 tons of petrol and 786 tons stores. Akabahra, Berto, Bjørkhaug, Evviva, Marga and Selbo are also named in this convoy (link in the table above) and Montbretia was among the escorts. In Febr.-1943 she made a voyage from Bone to Algiers with Convoy MKS 8, follow the link for the names of other ships in the convoy. She had left Bone on Febr. 17 and arrived Algiers on the 19th. She remained in that part of the world until Nov.-1943, when she returned to the U.K. (convoy info in Voyage Record above). She was also used during the invasion of Normandy in June-1944, arriving with ammunition on June 13, departing again on June 23 (this according to "Nortraships flåte"). Her 1944 voyages start on Page 6 (as can be seen, she appears to have spent several months in Cardiff from Jan.-1944, possibly being fitted out for this service?) and continue on Page 7. The latter document also shows some of her 1945 voyages, while the rest are listed on Page 8; convoy info for some of them can be found in the table above. From Page 9, we learn that she went home to Norway in Jan.-1946. Purchased by A/S Raagan (Thorleif Lea), Haugesund in 1955 and renamed Raagan, in seasonal lumber trade in the White Sea. Wrecked (sprang a leak) off Hoek van Holland on Jan. 3-1967 on a voyage Jøssinghavn-Dordecht, no casualties. Back to Hildur I on the "Ships starting with H" page. The text on this page was compiled with the help of: "Nortraships flåte", J. R. Hegland, "Våre gamle skip" by Leif M. Bjørkelund and E. H. Kongshavn, and misc.